Fall is definitely in full force here in Vancouver. The days are shorter, the leaves are falling of the trees, and the rains have arrived. All of this has given me the urge to get in the kitchen and do some baking. Something about that warm oven filling the house with smells of cinnamon, nutmeg, vanilla…it’s just so comforting and warming when it’s grey and cold outside. I knew it was time to bake some muffins. I had recently purchased a large 5 lb bag of BC barlett pears on a whim – they were on sale and in season – without any really plan for them. To be honest, I’m not even really a big pear eater. I often find the texture to be displeasing. But I was determined to find tasty ways to eat them, because they are a great fruit to include in your diet – high in fibre and a good source of vitamin C. Plus the boyfriend mentioned he likes pears, so I knew I’d have someone to taste test my creations. I first started adding them to oatmeal instead of say, apples or bananas. I took to spicing up the oatmeal with cinnamon and nutmeg. We both agreed this was a great flavour combination, so it was only natural to take those flavours and turn them into a muffin. While they may look fairly plain and unassuming, they have all of those great flavours of fall, wrapped up in a portable whole grain package. They are moist, hearty, and a little sweet. The oats, flax seed, and hemp seeds add texture and chew, while the nutmeg and cinnamon give them a warm, comforting spice. 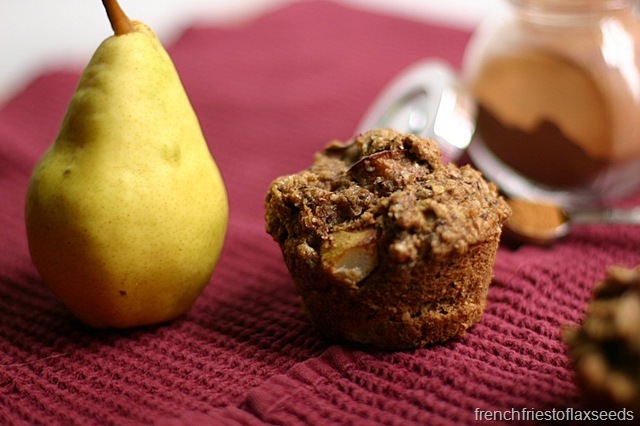 Most of the sweetness comes from the pears themselves, so they are great for a snack with a big mug of your favourite tea, or would also work for a quick grab and go breakfast. They also just happen to be vegan, because that’s how I felt like baking that day. 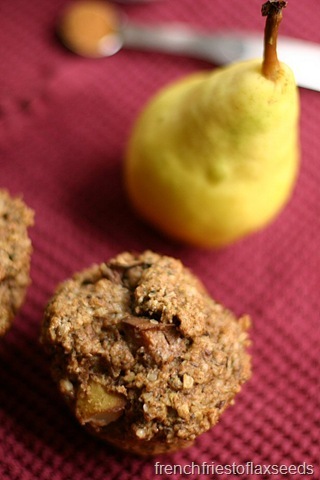 Warm up this fall with this lightly spiced, whole grain muffins featuring locally in season pears. They are slightly sweet and packed with fibre. 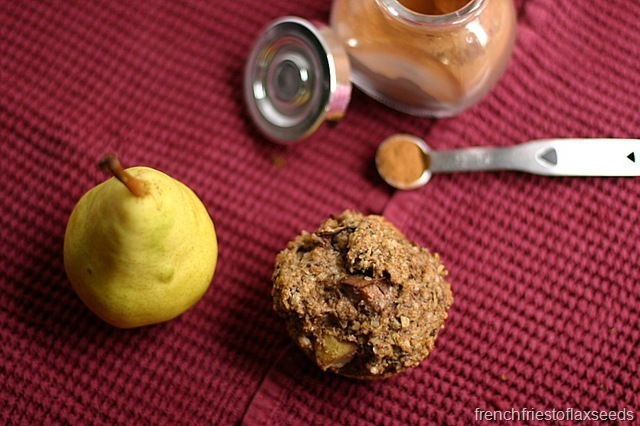 Great with a big mug of your favourite tea or as a healthy on the go breakfast. 1. 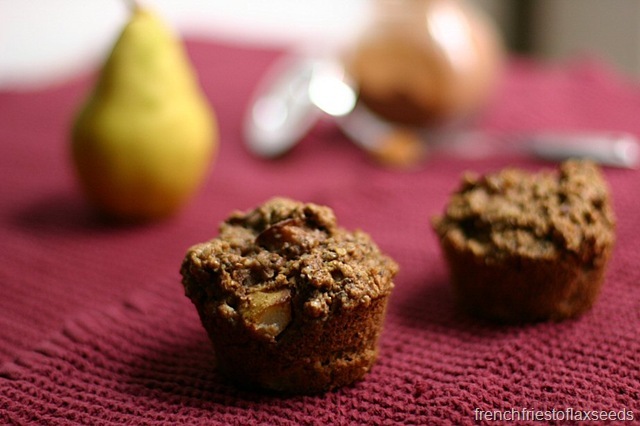 Preheat oven to 350 degrees F. Grease a muffin tin or use paper muffin cups. 2. Combine the flaxseeds and almond milk in a small bowl and set aside. 3. 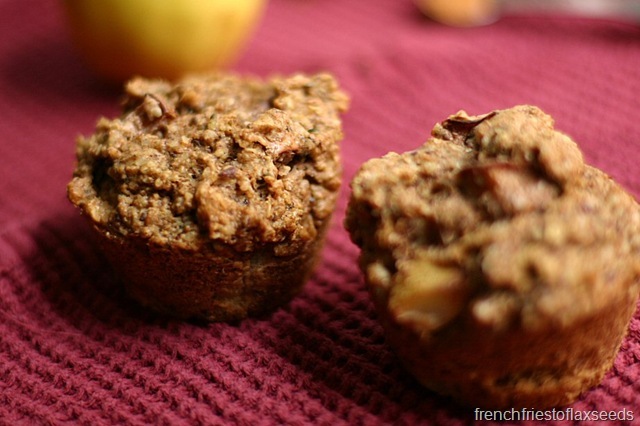 Combine the flour, oats, pears, hemp seeds, baking powder, baking soda, cinnamon, nutmeg, and salt in a large bowl, mixing until well combined. 4. Stir the brown sugar and vanilla in the flax/almond milk mixture. Add wet mixture to the dry ingredients, mixing until just combined. It’s okay to have a few lumps! 5. Evenly divide the batter between the muffin cups, and bake for 22 – 25 minutes, until golden brown. Note: You can substitute apples for the pears if that’s what you have on hand. I would suggest storing these in the fridge, as the fruit can make them mold quickly if left on the counter. Do you like pears? What are your favourite ways to eat them?